xPod is a music player that plays directly from the filesystem without the need for iTunes. Copy your MP3 files to "/var/mobile/Media/Music". xPod will do a Google Images search for the artist and album of the track that is playing and download the first result. You can override this by placing a custom image in the folder where the MP3 files for that artist / album is located. Make sure to use a JPG file and name it "x.jpg" for xPod to recognize it. It is best to use a square image of at least 320 x 320 pixels. In addition to the playback controls on the bottom of the playing screen, xPod supports gesture control of playback. Swipe vertically in the artwork area to play or pause. 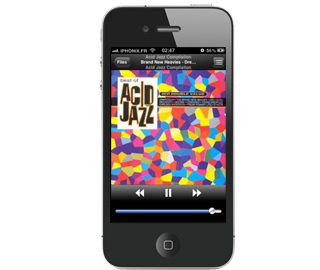 Swipe horizontally to skip to the next or previous track in the playlist. Single tap to show or hide the scrubbing bar, and double tap to show the current playlist.